This is an interesting twist. Last December Laika whacked about half of its CG film studio staff as their second animated feature hit development issues. Now 10 months later they decided that CG isn't their cup-o-tea at all. So they gutted the rest of their CG film crew, only keeping a few CG folks around for FX and for their commercials division. For better or worse, Laika decided that they didn't want to be a CG feature film studio, focusing on stop-motion instead. From a business standpoint I can see the logic. The CG film side of things is a pretty crowded racket. You have the big boys in Pixar/Disney, Blue Sky, Dreamworks, Sony-- and you have a bevy of independent efforts released under various monikers like WB, Universal, Focus, etc. Laika faced an uphill battle establishing a brand for themselves as another one of the third wave CG studios releasing films like Tale of Despereaux, 9, Planet 51, etc. In my view I'm sure that the leadership at Laika views brand recognition as a key goal. These are the same people who brought you one of the most successful global brands in Nike. They know the power of brand and they know how a strong brand buys you a good bit of wiggle room. (see: Cars. ahem). With the success of Coraline Laika was positioned in an interesting place. In business when your brand is not the leader of the pack you have two choices. You can work like a mule and with deep pockets, persistence and some luck find your place among the best in your field (a track that Sony Pictures Animation is hoping to find traction with on their 4th film). Or you go find something you do that is a bit different, but you do it better than anybody else and focus on making a go of it with that. It's hard to imagine Laika "out-Pixar-ing" Pixar, but it's completely reasonable to see them carving out a viable, successful place in stop-motion- which is their heritage. But even better- it's hard to imagine a place like Pixar "out-Laika-ing" Laika. That's nothing to sneeze at. I wouldn't be surprised if there was a cultural aspect, too. In speaking with some folks who worked at Laika before the lay offs it appears there was a less than subtle rivalry between the stop-motion crew and the CG crew. This isn't surprising, many "old media" artists and techs look down on CG. Not all of them, but it's not a rarity that's for sure. We all know there's no shortage of 2d animators who will bend your ear for hours over a coffee (or fill blogs) about the inherent limitations/failings of CG. Some of the complaints are valid, some are misguided efforts to make a square peg serve in a round hole and some are merely the jealous grumblings of those threatened or displaced by the popularity of CG films. It's a culture war that simmers barely under the surface of the animation film business and it will for decades to come. At its soul Laika is a stop-mo shop since it came from the Will Vinton studio. It's not too surprising to see the leadership there decide to embrace that going forward once they found they didn't need to fall back on the popularity of CG to make a viable go of it as a feature film studio. With the benefit of hindsight I get the sense that perhaps Laika looked at developing their CG film slate almost as a hedge against their stop-motion titles not doing so well. 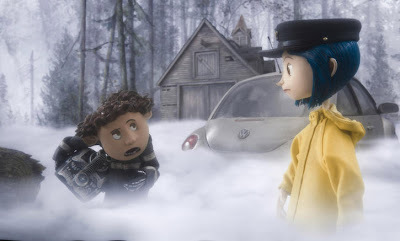 It's reasonable to think that the success of Coraline emboldened them enough to drop that hedge and go full press for stop-motion. So now we can add Laika to the short list of Aardman that is a proven feature film stop-motion studio. Certainly a less crowded arena in which to stand. Then there's the human side of it all. It's a bummer for the folks who got laid off. I had a good number of friends affected by the first Laika whack-job and I know of others who probably got the axe this time, too. Getting laid off in a one-horse animation town like Portland is rough. There's not much else for you to do there, so you gotta sell the house, move the family and shamble on down the road to the next gig- provided you can find it. If these folks bought homes in Portland in mid/late 2006 (when Laika did a bit of ramping up in CG staff), then they're double trapped because home prices in the Portland area have taken a pretty big hit. The animated film biz is very, very transient and being on "permanent staff" is no guarantee of stability. Big Idea, DNA, Blue Sky, Laika, Disney- they've all either gone out of business or had major, major staff reductions of permanent full time workers who thought they were above the rough and tumble world of ramped up/down contract hires. I find it ironic that at the time when there are more animation jobs in film, fewer and fewer of them are attractive to the aging CG workforce. In the end this skews the workforce to younger, more mobile people with less experience and a willingness to work lots of hours- much of it unpaid OT. As people age, grow families and desire stability the experience is getting squeezed out of the labor pool. In the end this only hurts the studios and the films as well. The medium doesn't have a chance to capitalize on past experiences and lessons learned- technically, productively or creatively. So the same ground gets re-hashed and the same mistakes get made year after year, just the faces change. It's a cruel business and here's hoping folks can find a place to land that works well for them not only creatively, but for their families as well. It just goes to show that I learn something new everyday when I come to this site: business positioning, the importance of branding and the insecurity of full-time employment. You're also spot on concerning "Old media" artists filling blogs with lamentations on the folly of CG (The phrase "Ren..." comes to mind, oh well). That being said though, one has to wonder why studios like Jim Henson's family of studios (ie:Creature Shop) have been able to get along relatively well with both CG and puppeteering work for the past several years? Great stuff as always Keith; thank you for sharing, as I'll have to pass this along to some folks that were recently entertaining the idea of finding work with Laika. this IS a tricky business. I didnt realise how lucky i was to experiance the Tale of Despereaux, I wonder when the next 3d feature film will be done in London. Many folks were quick to move on to other countries for the next big thing, but mostly younger people. What a mission! I've been lucky so far, and I guess the best is to keep positive and keep your ears open. 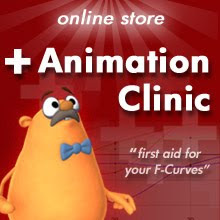 Though I'm quite happy doing kids tv animation for a while, I know many who wouldn't like it. There were also several cg feature animators who were adamant they would not work in VFX, for similar reasons to the 'traditional' outlook you pointed out. The popularity of more stop-motion features may actually help 3d in the long-term, a contrast, so it doesnt feel as overdone as it does right now. maybe not? "You're also spot on concerning "Old media" artists filling blogs with lamentations on the folly of CG (The phrase "Ren..." comes to mind, oh well)." As far as CG goes, can't people telecommute? Seriously, CG guys shouldn't have to sell their homes to sit in front of a different computer, in a different town. That alone could change the human element. Well, you (whoever "you" are) and I both know that "Mr. Ren" has never been too conservative on his views in general on the matter. Although, from last I recall he was somewhat pleased with how "Horton..." turned out despite the use of blur effects in certain spots (I pretty much agree with him on that one). Make no mistake, I absolutely adore the man and his body of work (I made a PDF of all of his layout notes a while back for Traditional and CG animation, students at the school I attend and for the ASIFA archives as it's all very important info, whether it's applied to CG or not), he was just the first person that came to mind when Keith made the original comment on the matter; it wasn't meant to be a slight or put down in any way. Thanks for the info, Keith. I had heard about the layoffs at Laika, but hadn't yet had a chance to email my friends there and get the story yet. My heart goes out to my fellow artists who are having to face a transition period Yet Again. What is content and what is its value? "I've got a real knack..."